While you’re high on the celeb wave, you have to make the most of it, never know how long it’ll last. The Company for Women teamed up with Fergie for a new product. With top notes for Iced Berry, Star Fruit and Wild Saffron, Outspoken’s middle tones were described as Intoxicating (Tuberose Absolute, Midnight Jasmine, Passion Flower) and the low notes as Fearless (Racy black leather, Raw Ebony Wood, Smokey Vetiver). 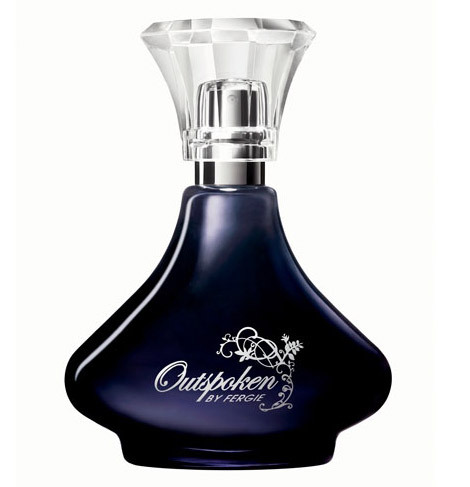 Also the bottle was inspired by a crystal decanter from Fergie’s wedding. Fergie is my new rock-hero! What a screamer, in the good sense. Her version of Paradise City and Beautiful Dangerous on Slash album has stole my heart. That’s “outspoken” enough for me. What is this with all these celeb perfumes? There are too many scents around for my taste. Why not jam? Or a low fat (of course ;)) cereal or wash liquid? Looks like fun to me! I would have to smell this perfume before I could say if I liked it and of course try it to see if it mixes well with me. As for the perfume made by the famous and infamous I hope that they are at least involved in so part of the making process. I’m not nec. a fan but her one-song performance in ‘Nine’ was SUCH a show-stopper! She was easily the best thing about that (incredibly boring) film. Ellington, I’m gonna purchase B.E.P. “The End” and find out about her solo album. cc, says she’s the showstopper in NINE? And she rocks with Slash and Cypress Hill “Paradise City”? I am an Avon Rep. and I also bought this perfume for myself and I love it. Even my Husband liked it. well, go on then, tell us what it smells like. Is it floral, citrus or what? Yes. The ad says it’s “An outrageously bold expression of iced berry shockingly contrasted with ultra-feminine tuberose absolute and racy black leather”. So to me it’s a great mix and smells wonderful. Do any of you guys have the perfume? How much do you willing to pay for it with a free fergie bag? I have it. The perfume, bag, necklace and lotion. It’s 36.00.